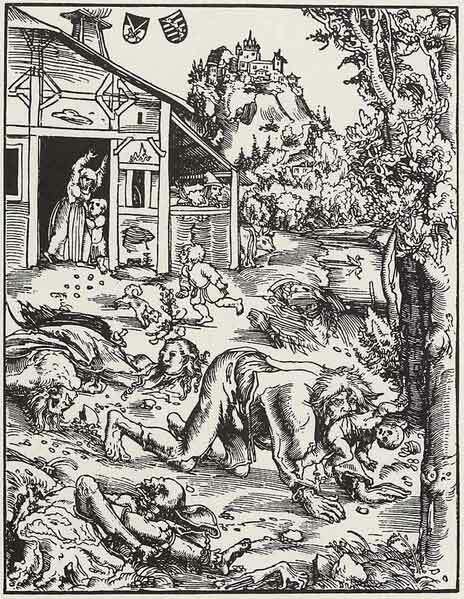 Bishop Olaf Magnussen, who signed his treatise “History of the Goths, Swedes, and Vandals” (published in 1555) with his Latinized name Olaus Magnus, stated that the people living in Prussia, Lithuania, and Livonia often lost their livestock to bands of hungry wolves. But, their losses caused by natural wolves were nothing compared to what the werewolves caused. According to the Bishop, large numbers of werewolves prowled the areas, attacking not only livestock, but humans as well. The beasts infiltrated isolated farms, broke into people’s homes, and ripped apart and devoured every living thing they came in contact with. He also declared that the Livonian werewolves were initiated by draining a cup of specially prepared beer and repeating a special incantation. It was said that the werewolves’ favorite meeting area was an old ruined castle near Courland, a place that no one ever went near for fear of death. Even though this was the hang out area for werewolves, it wasn’t always safe for them there. According to reports and rumors, the stronger werewolves would instantly kill those weaker than themselves. Many people at the time took Olaus Magnus’ words to heart, even though he was also the one that came up with the ridiculous idea that Scandinavian devils came nightly to clean stables and feed animals. Oh and Devils also worked in mines, but the residents ignored the Devils amongst them for fear of having their heads twisted backwards. He also stated that most sea captains would call on a devil for help with navigating their ship. Apparently these devils had the power to control the elements and could create safe sailing weather. Yeaa… But according to the Bishop, ignoring these Devils or making deals with them would cost you your eternal souls. Obviously this guy was a bit wacked, but then it was the 1500s after all. At least we got some entertaining werewolf stories from him.